Frieda Loves Bread: Prime Rib in June? Yes! 5 Prime Rib in June? Yes! 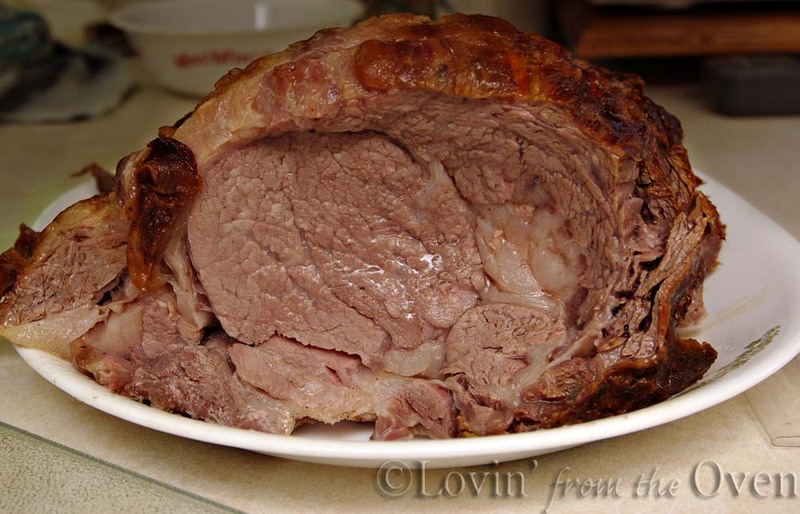 Finding a prime rib roast in June is like trying to find a black dress for a summer wedding. Family from out of state were in town to visit and my dad wanted to have a dinner. Not just any dinner or backyard BBQ. He wanted to have a prime rib roast like I cooked for my Christmas dinner. We saw a Harmon's ad for "choice" rib bone in steaks for $5.99 per pound and thought, "Why not ask the butcher to keep it whole as a roast?" 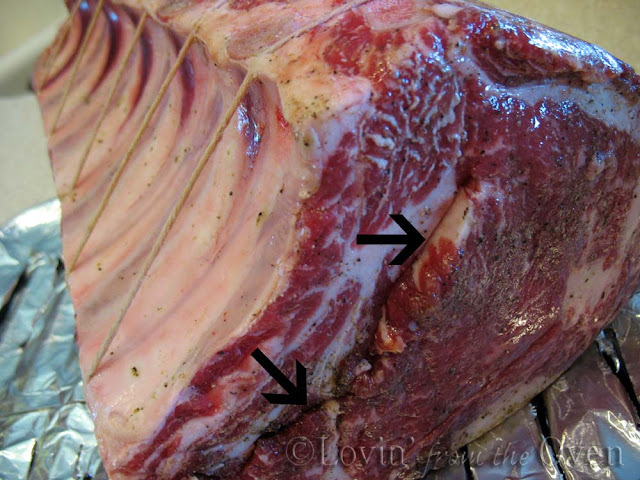 (Meat is graded with Prime being the highest grade; Choice is next, and Select is last). The butcher was great! Not only did he keep the roast whole, he cut the bones away from the meat (see arrows on the left picture), tied them back on and seasoned it for no extra charge! You want to keep the bones on to act as a natural 'rack' for the meat and to add flavor. What's Cooking America is an excellent site for selecting the meat, cooking it, and some extra recipes for making Au Jus, and a sour cream horseradish sauce. The first thing you have to do is bring your meat to room temperature. This can take anywhere from 2-3 1/2 hours, depending on the size of the roast. This is to ensure even cooking throughout the roast. The only piece of special equipment that you need is a digital instant read thermometer. I am fortunate to have an oven probe with my Kitchen Aid convection oven. After the searing, I put my probe into the meat, making sure the probe did not touch bone or fat. The oven is turned down to 300ºF and the probe is set for 130ºF. 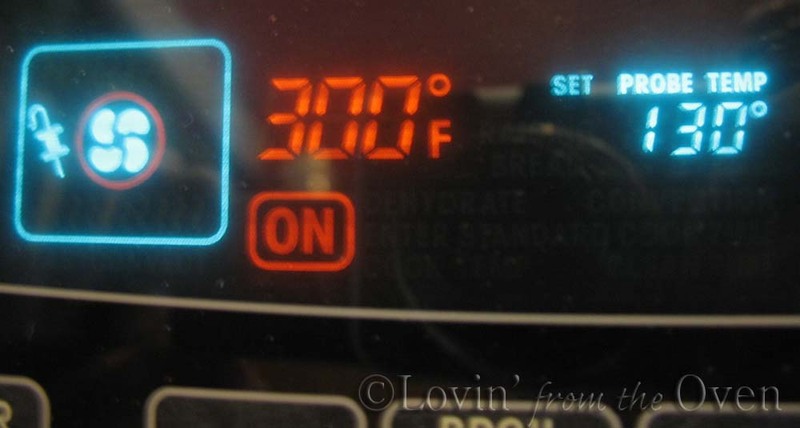 Once the probe reaches this temperature, the oven will beep and shut off. What's Cooking America has a chart that lets you know when to check your roast with an instant read thermometer. 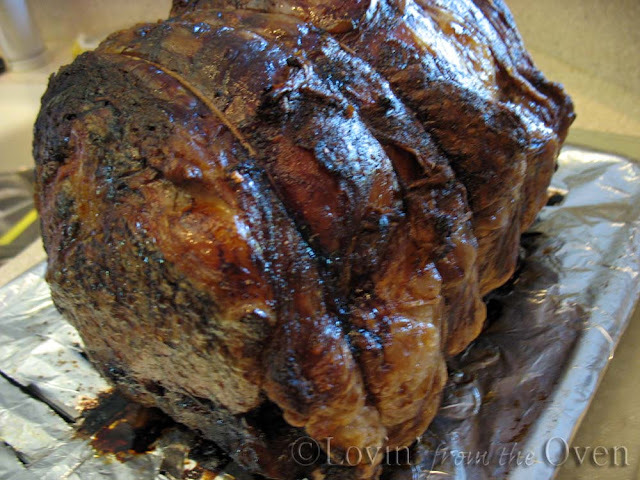 This 12.5 pound roast took approximately 3 hours and 15 minutes to reach an internal temperature of 130ºF. I immediately put plastic wrap around the hot roast, covered it entirely in aluminum foil, some old bath towels and put it into an insulated cooler, like in my smoked pork post. The meat will stay hot, rest for an hour (to redistribute the juices) and rise in temperature (10-15º) during this time. After a 90 minute rest, the roast came to a perfect medium (145ºF). This roast was a hit with everyone. When Prime Rib goes on sale in the holidays, I'll be stocking up and enjoying this meat year round! Jan, I have no idea what the butcher seasoned it with, but my last roast, I just inserted slivers of garlic an sprinkled fresh chopped rosemary on it. Even in this stinking hot weather that prime rib looks so stinking good Frieda! YUM! I love the intro comment since our moms both found black dresses for our July wedding. This really was good and I've never been a fan of prime rib. I enjoyed that it was medium instead of medium rare or rare. I wish I'd had some horseradish sauce, just because I like that. The Au Jus was delicious on the potatoes as well. Frieda, Thank you for this post! I haven't made a prime rib yet, and your instructions make it look very easy.